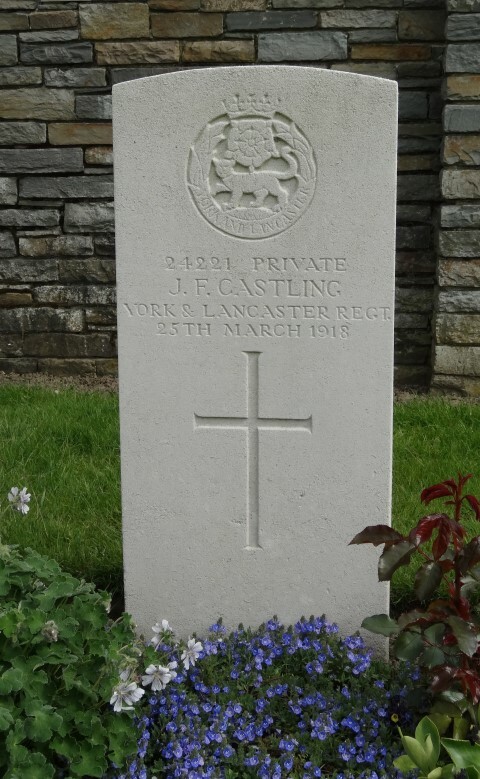 242211 Private Joseph Franklin Castling, 1/5th Battalion, the York and Lancaster Regiment was killed in action 25 March 1918 and is buried at Polygon Wood Cemetery. He was 33 years old and is commemorated on West Auckland War Memorial and the Roll of Honour in West Auckland Memorial Institute. In 1881, the family lived at 3 Craddock Street, Bishop Auckland where 28 year old William worked as a postman. William Castling died 1891. In 1891 37 year old Margaret is recorded as a widow and lived at 16 Clayton Street, Bishop Auckland. Only 16 year old George was in employment and worked as a coal miner. In 1901, William, Joseph, Mabel and James are recorded as sons and daughters of James and Elizabeth Nelson. Their sister Mabel was then married to Jonathan Bayles and lived as boarders. James Nelson was a farm manager and the extended family lived at Staindrop Field Houses, to the west of West Auckland. In 1911, 26 year old Joseph F. Castling is recorded as living with James and Elizabeth Nelson and their daughter Mabel Nelson (aged 22 and single) and their grandson 13 year old James Albert Castling. Joseph worked as a colliery labourer. The family lived at 8 Toadpool, West Auckland. Joseph Franklin Castling enlisted at Newcastle-upon-Tyne into the Northumberland Fusiliers being given the regimental number 32/651. He later was transferred to the1/5th Battalion, the York and Lancaster Regiment, regimental number 242211. 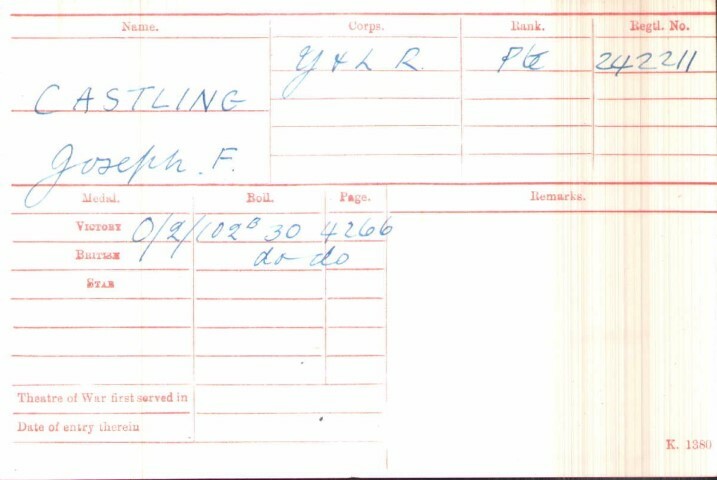 The service record of Private J.F. Castling has not been researched therefore the date he entered France is unknown. He was not awarded the 1914-1915 Star therefore he did not enter France before 31 December 1915. In January 1918: the brigades were cut down from 4 to 3 battalions and the 49th was still in the Ypres Salient at the beginning of April when the German offensive on the Lys commenced and the British were “fighting with their backs to the wall”. Private J.F. Castling was killed in action 25 March 1918 some weeks earlier together with Private J. Gee [formerly of the Leicester Regiment]. Over the days preceding and following 25 March, 23 – 30 March the battalion suffered a total of 6 deaths  therefore it is concluded that there was no major engagement along this part of the front. The German Spring offensive was taking place to the south on the Somme. It is assumed that these soldiers were killed as a result of the usual violence of warfare, probably shell fire. Private J.F. Castling is buried at grave reference A.1 Polygon Wood Cemetery near Ypres. 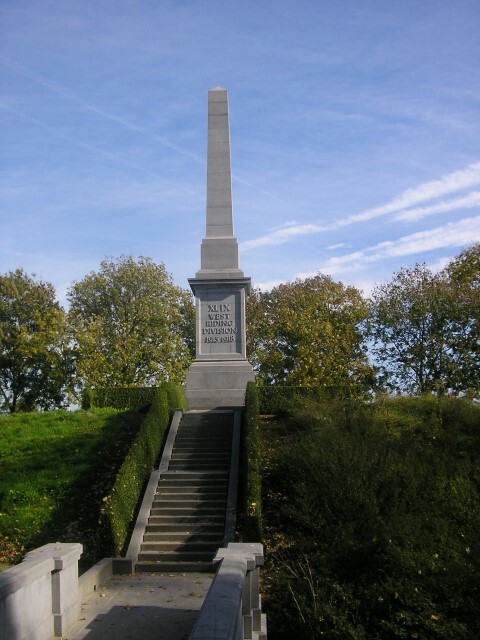 Memorial to the West Riding Division, situated on the bank of the Ypres canal near Essex Farm, Boesinge. It is an appropriate location, for the Division spent many months in the Ypres salient. Private J.F. Castling is commemorated on West Auckland War Memorial and the Roll of Honour in West Auckland Memorial Institute. 1901 census The relationship of James and Elizabeth Nelson to the Castling siblings has not been researched. Soldiers Died in the Great War Note: recorded name is Joseph Franklin Castlin.